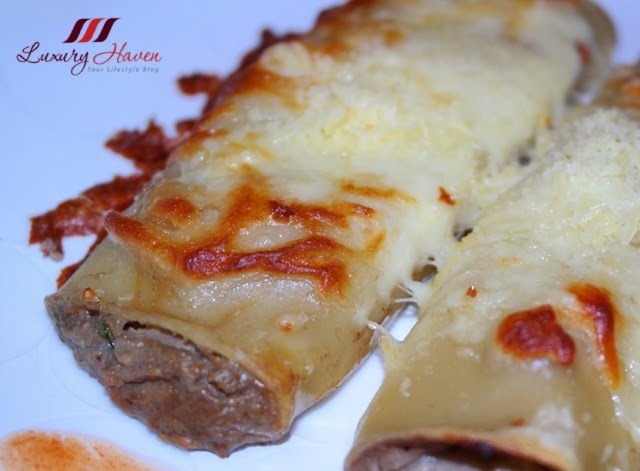 #Cannelloni, like Lasagna, are both popular in Italy and used for traditional egg pastas. 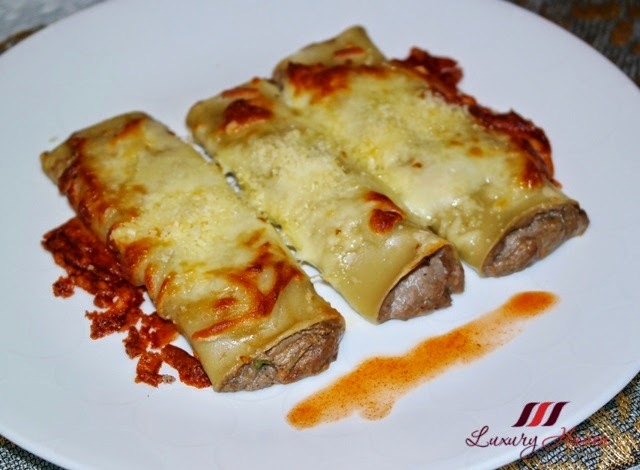 A cylindrical type of pasta, Cannelloni is generally served baked with a filling like minced beef covered by tomato sauce. 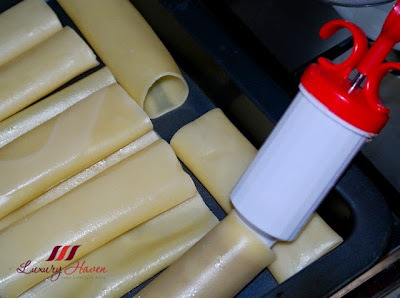 I have always wanted to try Cannelloni but since I am not a fan of tomato-based pasta like the Spaghetti Bolognese, I kept in on hold till an idea of using Foie Gras surfaced. 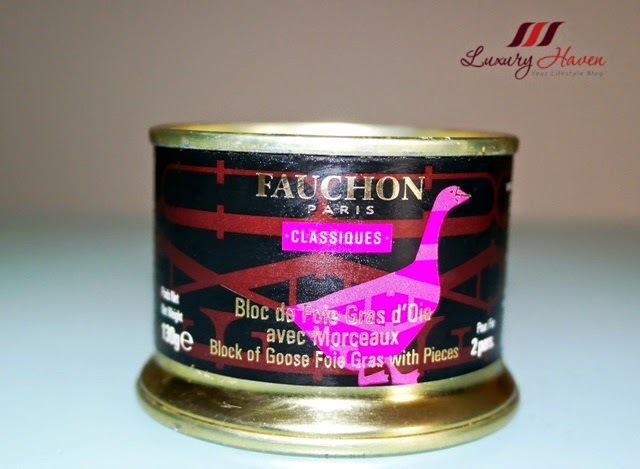 #Fauchon has been the culinary creator for gourmet products such as Foie Gras, fine chocolates and fruit-flavoured teas. 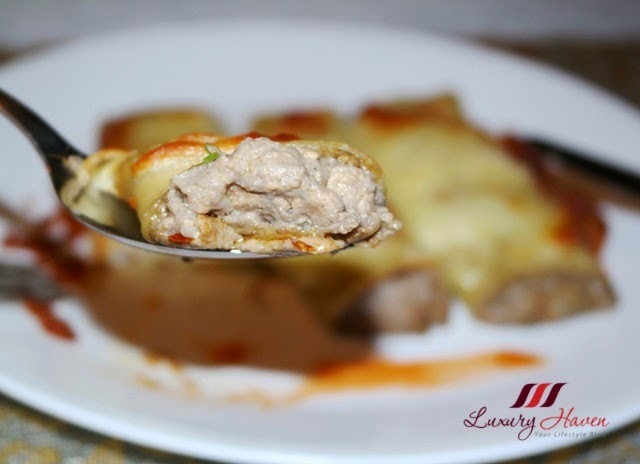 Being a fan of this goose liver, I decided to stuff my Granoro Cannelloni with Foie Gras. The tube of the pasta is huge and requires a lot of fillings so I cheated and mixed my liver with mushrooms. Not knowing what method is best since it was my first attempt, I did a twin pasta - one served original with a drizzle of Balsamic Vinegar and Grated Parmesan Cheese, and the other Baked with Mozzarella Cheese. The result was a satisfying one and I am glad my family had enjoyed my efforts. 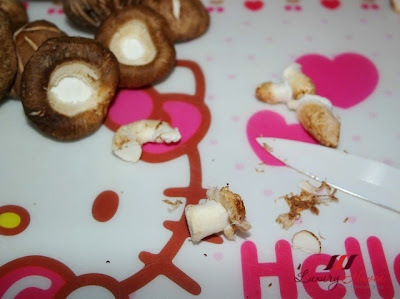 Remove mushroom stems, but do not throw them away. Cut off the ends of stems, and gently scrap off the outer layer. Cut mushrooms into smaller sizes and throw into blender. Add cream and blend well. 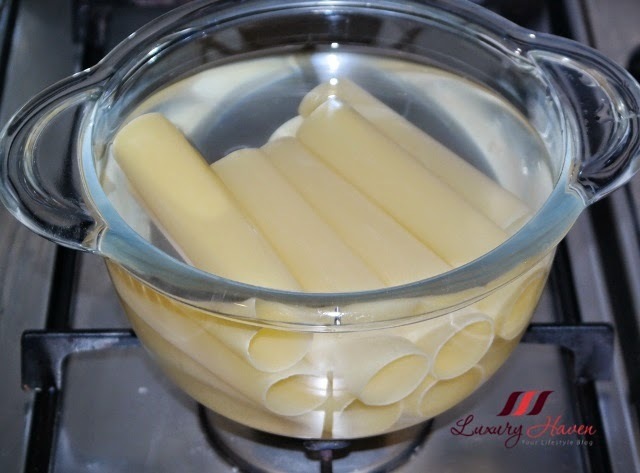 Cook pasta till al denta. Drain and set aside. Alternatively, you can skip this part if you're using the baking method but you will have to cover the uncooked stuffed pasta with lots of sauces to prevent them from breaking. Heat oil and add blended mushrooms, seasonings and parsley. Cook for about 3-5 minutes. 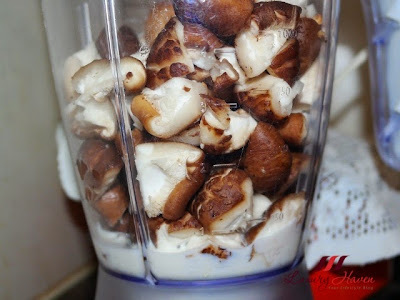 Mix mushrooms with foie gras. Start filling the tubes with foie gras mixture. 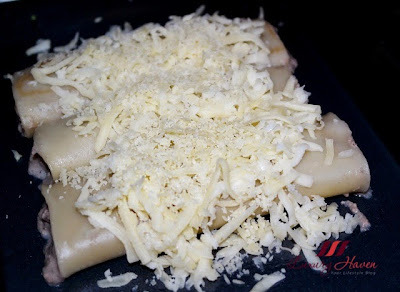 Place some grated Parmesan cheese onto serving plate and lay half of the Cannelloni neatly. Drizzle balsamic vinegar and top with scallions, and you will get a yummy pasta dish with foie gras! Preheat oven at 200°C ( convection oven ). Place the remaining half of the Cannelloni onto a baking tray, and top with a mix of Mozzarella and Parmesan Cheese. 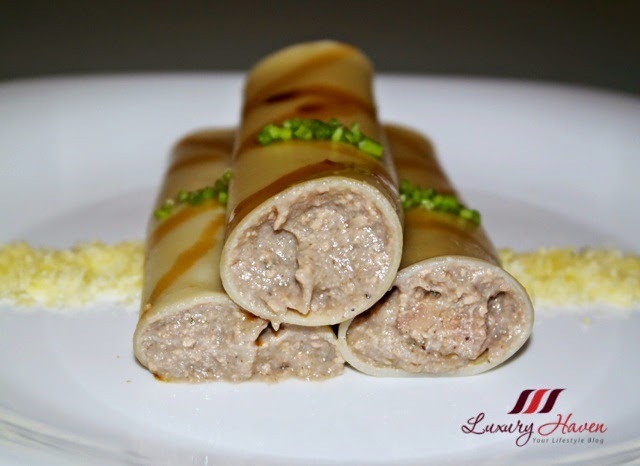 Bake till golden brown and you will get a cheesy version of Stuffed Granoro Cannelloni with Foie Gras. Serve with Tabasco sauce for a spicy kick! 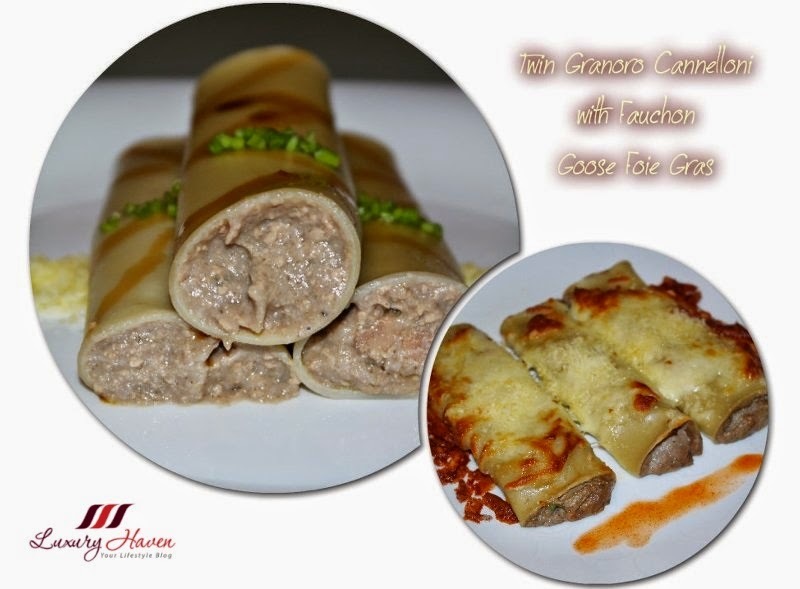 Which version do you prefer - the Original Stuffed Cannelloni or the Baked Cannelloni with Foie Gras? Well, the cheesy pasta certainly got our family's votes with the creamy goose liver and mushroom mixture oozing out of our tube pasta! I love this dish !! Happy Friday !! 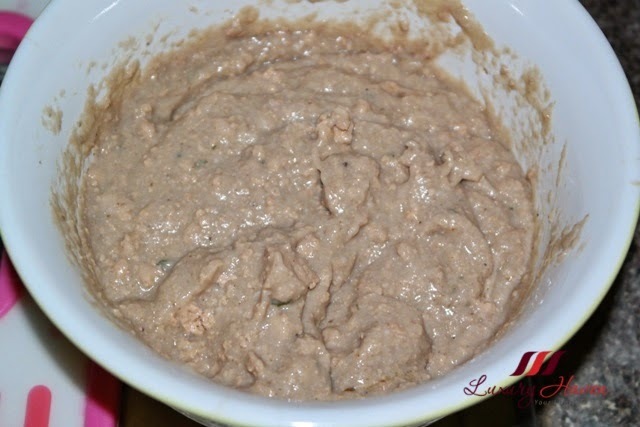 Wow.... delicious recipe!!! 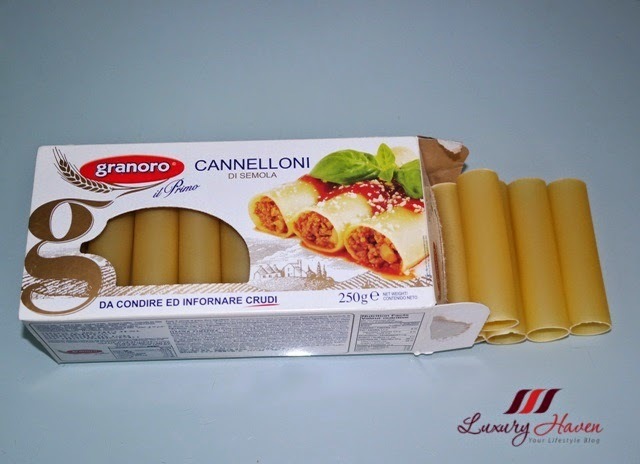 I love cannelloni Granoro!!! Shirley I just loooooooove cannelloni. It looks mouthwatering delicious, babe. I m italian and so i really love Cannelloni! Oh-so yum. Very nice. For us, its always about Asian food. i am not fond of pasta, but it looks hoid though! Amazing recipe, Shirley. I had never thought of foie gras cannelonni. Thanks for sharing! This looks incredible! Must try this! I love canelloni, but this is new one for me. This looks so yummy! I will have to give it a try. My only worry is if i will fine those big pasta. This is the 1st time I came across Canelloni, so this is how it should be eaten. Thanks for the tips, this sure make a good choice as pack meal. Mouth watering, as usual perfectly done. Looks really tasty! I love both ways. Have not tasted foie gras before and don't think will do so due to the way the goose are being raised. I've tried with spinach, with chicken, with vegetables, so being a fan your recipe make me droll. How delicious! My boyfriend and I love foie gras, especially pan seared and in a mousse/parfait/terrine type form! This is definitely an innovative way to prepare it and so luxe too! I've been wanting to make this but stuffed with cheese and spinach! Ugh, need to do it soon! You're an excellent cook, 2 thumbs up for you.